I decided to install the Microsoft service pack 3 which went fine until I rebooted, then all mayhem broke loose. Windows XP booted to an unuseable system. I was not pleased. I was not ammused. My Linux partitions worked fine but were now under threat because the only way I could see to remedy this situation was to use the recovery disks I had made when I first bought this laptop. The recovery system reformats the whole disk, so everything goes, which is a real pain as all I needed to do was reinstall windows. So after backing-up everytthing I went for the recovery disks. Doing this alowed me to re-think and re-organise the hard drive so as to have two large data partitions, an “everyday” partition, a “work” partition and a “ test partition”. So the hard drive would have XP (cos I have to have for my studies), SimplyMepis as the everyday system, Debian Lenny as the work system and Sidux as the test system. As you might of guessed, I like Debian. “And Ubuntu?” I hear you ask. No I don’t like Ubuntu as after each 6 months its like doing an install with a new system and you never know what you are going to get. Will it work fully or not? Enough of Ubuntu before I say too much and this becomes something its not meant to be! So I did a recovery and reinstalled XP and all my favorite applications, which took the best part of 4 hours, and I’m still not finished. On the other side, installing Mepis, Sidux and Debian together took one and a half hours and an extra half hour to set-up java, flash and networking. Sidux was the first to go on. I decided to use Sidux bescause as I’m using debian as my main workspace Sidux will give me advace notice as to what is coming up and how well it works and do I need it. Sidux is also very fast and therefore should be good for working on batery, we’ll see. Sidux use kde, kde-lite or xfce desktops. Kde-lite was chosen so there is maximum choice as to what else is installed, almost like a minimum graffical install. I wish someone would do this for Gnome, a Gnome-lite. I live in hope! Debian was next, even with the old text driven installer, there was a strange sence of comfort that I was installing an old friend. All went smoothly. The only thing I had to do was to connect to the internet through a wire the retreive the wireless drivers. After that all is sweet. I’ve added the Mepis repos and Mepis Community repos too and installed some of the latest applications that the Mepis community have put there. I’ve also installed openbox window manager to replace the standard metacity window manager. This speeds up an already speedy laptop. The lastest wine and the free Crosover is also installed, with which I now have Dreamweaver MX and Flash MX running fine. All I need now is a way of getting Photoshop CS3 working… (these applications are needed for my sstudies, although I am also using Gimp, inkscape, and Quanta). I must say to start with, I like Mepis. It isn’t prefect (it uses kde as its desktop) but underneath it is good and I quite like Warren’s views as to what a distro should be. I also like the way that a communty has gathered round and started using their skills and enthusiasm to help ans improve the(ir) distro. I first used SimplyMepis a few years ago when the Gnome desktop was supported along with Kde, this choice I liked as after trying a few desktops I prefer Gnome and fvwm. Mepis was installed last. All went smoothly and it found all the network cards automatically. I’ve setup gnome with openbox and fvwm-crystal as main deskops. In recent days I swapped Sidux for Ubuntu because I’d read that some people think its the best thing since sliced bread and as I hadn’t tried it for a while, I thought I’d give it a go. My conclusions are that some apps are old or out of date for what I need, think wine, and there was something about it that just didn’t feel right. At the moment I can’t put my finger on it, but there is something about it that makes me uncomfortable using it. I have configured Grub to run from the Mepis partition and also from each partition so when booting up I have a choice of either the relevant kernel for the different systems or a link to a more specific menu for that partition. This alows me to update and upgrade the kernel and not have to manually update grub each time.. I am using Gnome with openbox as the main desktop except for Sidux where it’ll run kde-lite. On all there is FVWM and FVWM-crystal. I have found that these two desktops with rox-filer rather intriging. I will be working on these as a side line just to see what they can do. One of the reasons I moved to Linux was that I felt that windows was becoming bloated and therefore slow, and I feel kde and gnome have been following this trait. I have a Toshiba laptop with 192meg ram, which runs linux very nicely, but I can’t run suse or fedora for the memory is too small for them. It can however run debian. FVWM (and crytal) are very light-weight. Just because more memory is available and becoming cheaper doesn’t mean you should use it. Just because a car can do 150 miles per hour doesn’t mean you should. I am using openoffice to write this and was thinking about how many of the tools and facilities availble to use I use. Very few. If openoffice made it modular so you only installed what was needed, then its “memory footprint” would be reduced. I have also started looking at windowmaker. Amother lightweight desktop window manager. This is easier to configure than FVWM and the eye-candy is interesting. I think the reason I’m not sure about Ubuntu si that it apears to be more of a fork of Debian rather than based upon. With other Debian based distros you can install various packages from either onto either, Mepis to Debian and Debian to Mepis, and it will not break, but with Ubuntu it is different. If you install an Ubuntu package onto a Debian system, you are likely to break it (personal experence), and from Debian to Ubuntu it might not work, even though Ubuntu uses the .deb package. A little bit like eing locked into the ubuntu system (reminds me of someone from Redmond). Shame. I will state here that I do understand that Ubuntu does contrbute back to Debian upstream. Mepis is good and stable. The community continues to develop around it, although I have noticed some growing pains, but I think these are healthy. If the community continues to grow strongly and Warren continues to head it, I think Mepis could become better and easier than Ubuntu because it is made by users for users rather than developers. Debian is the old trustworthy. Solid and dependable. Sidux is fast and challanging. I have been writing this over the last few weeks and keep adding to it on an almost daily basis, so I will publish now and post updates as to how I get on with the different desktops an which one I stick with. I’ve been blogging (albeit on irregular intervals) for a while, here and on blogspot and sometimes on LiveJournal. I moved here because I consider wordpress to be better for several reasons. It is open source, a good reason, and it is standards compliant. I have installed wordpress on my server and it is easy to use and modify because it is standards compliant and well written. Another reason is that I do a fair amount of writing ‘off-line’ and have found that there are off-line blogging clients which work better with wordpress than with blogspot. Blogspot seem to change their system every so often which creates hassles for the clients and their developers (good ol’ Google!). So, on to the clients. I used to have a mac, a G4 iBook. A good machine but I gave it away to a friend as I collecting to many laptops and my wife suggested I ‘loose’ some. Also I found being ‘locked’ into a system was too restrictive. On the mac I used Ecto, which was and is a great blogging client. But, it only runs on mac, although there was a windows version which I think isn’t being developed anymore. As I don’t use a mac anymaore, and I don’t like using windows (too full of bugs to be paying money for), I use linux (as you might of guessed from my previous post) and finding a blogging client to work on linux is difficult. There are some good ones that work on windows which wont work on Linux even with wine (www.winehq.com) but linux does have a few, most of which are fairly simple. There are two that I came across that work and have some good features and both require java. One is petrus-blogger. It is good but it seems a little unstable and for some reason wouldn’t work on my system with wordpress, no matter what I tried. 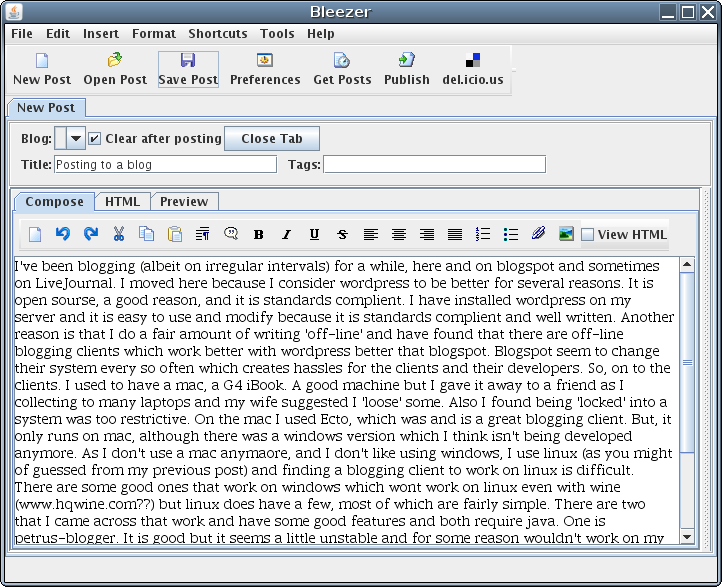 The other is bleezer, which I am using now. It seems to work well, but doesn’t like it when I am off-line with wordpress because it can’t access the list of posts, but other than that it works well. It isn’t the prettiest to look at, as it seems with most java applications, but is functional. It has a full array of formatting options along the adding hyperlinks and posting images, although here it didn’t seem to work and I had to manually upload this screenshot. It also seems stable so far. For looking at these applications, it seems a shame that so much effort has gone into producing something useful, and then nothing, almost like,”Ok, I’ve made a product, see, it works, now I’m going to stop and do something else”, a bit like a “3-day wonder”. Its satisfied a need, scratched the itch, served a purpose, an now discarded with no thought given to those who’ve pick up the tool and now feel rejected and cast aside, floundering and not knowing where to go or what to do… There come a responsibility when producing a product that people come to rely upon. Is this software still under development or has it run its course? In most cases, most developers act responsibly but there are the odd few who put something really good together, release it into the wild and thats it, leaving it there hanging. Shame. There has been a bit of talk lately about Puppy Linux in the media, well, when I say media, I mean the media I read! So I thought I write my bit. I came across Puppy Linux quite a while back, I think it was in 2003, but it might of been 2004. Anyway, I found it interesting because it could do so much but packed into such a small package, a bit like DML, but more user friendly and more intuitive for those dragged up on windows. I also found that it didn’t quite work well enough on my hardware of the time, a Toshiba laptop. I also liked the idea of making your own custom version, a bit like "Pimp my Puppy", but never got round to doing it as I didn’t have the time. Another curious character of Puppy Linux was that it is developed in Australia. When I found this out, I understood some of its quirks! I have been to Australia and found they do things slightly different there, which is good. So Puppy Linux is different. Now with version 4.1 I have found it to be really useful. With mounting of drives and partitions and a partitioning tools along with anti-virus tools makes this distro a must have in my "help" box of cd’s. I’ve already helped out a couple of colleagues at work with it and I’m sure a few more will be helped out in the near future. Running Puppy Linux is a breeze from boot up through to desktop going through a keyboard config (which is straight forward) and a display config ( which I wish did an auto test before moving on) which isn’t as straight forward for someone without any knowledge of computers. Then comes setting up the internet connection. Again, for me quite straight forward, but for someone with limited knowledge of computers, they could become stuck… for a while. The wizard is good though and does explain everything well. (If only I’d read before trying!). Once up to desktop, everything is to hand and Puppy Linux zipps along at a good pace. I have a P3 700 Mhz machine with 192 Meg ram and this with Puppy will give a Core duo 1.6GHz with 1 Gig ram a rum for it money with debian Linux, and blows it out of the water with windoze. Personally, if you have an old PC or laptop that you’d like to get going and use or give away, Puppy is a way of doing this with a touch of style.